Who can join the Friends in taking action for biodiversity? Your team can take positive action to help the endangered species in our community including Victoria’s faunal emblems, the critically endangered Helmeted Honeyeater & the endangered Leadbeater’s Possum! Corporate groups are encouraged to talk to us about our corporate volunteering days. It’s not too late to act but the time to act is now. In 2010 we planted over 12,000 plants with corporate groups. In 2011 we planted 16,688 indigenous trees, shrubs and grasses at Yellingbo Nature Conservation Reserve. Our total revegetation for 2018 was 31,152 plants. This was all done with volunteer participation through schools, corporate and community groups – a massive effort! Can you help? Our planting year runs from April to November. Will you be part of the 2019 team? We hope so! All activities are undertaken under the supervision and direction of either our Education Coordinator or Nursery Manager. All equipment is supplied with full orientation to the days activities provided. We invite you to participate each year to grow and/or plant more plants and check on the progress of trees and shrubs that have been planted in previous years. We experience strong growth rates and a fantastic 90-95% success rate with our plantings. Is it worthwhile putting in the energy and time to plant with us? Absolutely! Interactive PowerPoint presentation. The issues for threatened species with a focus on the Helmeted Honeyeater. What is biodiversity? What can everyone do to help? 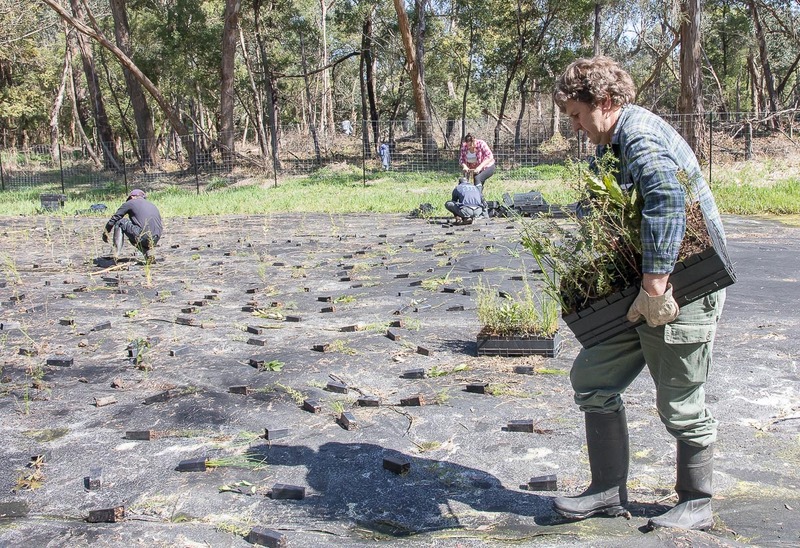 Our revegetation days are contingent on the ongoing support of organisations such as Melbourne Water (through their Community Grants Program), Parks Victoria (through their Healthy People Healthy Parks Grant Program) and Federal Government (through Caring For our Country Community Action grants) to fund planting activities. To secure most grants the Friends need to match them $ for $. We welcome matching funds from corporate groups. Where grants are available there is no charge for our activities. We do however encourage your group or the individuals who participate to take out Friends of the Helmeted Honeyeater membership ($20 p/a for groups/non-concession & $10 for concession card holders) as a positive action to assist in biodiversity conservation. – Brief nursery tour on arrival Minimum 4 hours. The Friends of the Helmeted Honeyeater (the Friends) make every effort to provide a safe and enjoyable environment for participants. Please notify us of any special considerations regarding participant welfare and specific needs when making a booking. All participants should wear sensible outdoor clothing – preferably long trousers, long sleeved shirts, sturdy shoes, sunscreen and hats. In wet weather gumboots are advisable. To ensure the safety of all participants, excursions to Yellingbo Nature Conservation Reserve do not operate on days of high fire risk or high winds. In the event of extreme weather conditions the Friends will contact the group supervisor about postponing the event. We endeavour to give as much warning as possible and visits can be rescheduled. Please advise the Friends of your group’s policy.